Experience the benefits of hospital tape that will stick and stay put even in water. These adhesive tapes, dressings and bandages provide a protective-waterproof cushion for wounds, which allows them to heal properly. They stretch and flex with the movement of the body while stabilizing an injury and protecting the wound. They are ideal for use within the shower or bath. They will even protect your injuries while you enjoy a day swimming at the pool. 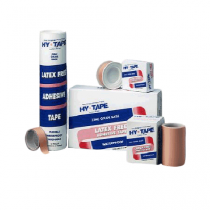 Waterproof tape is comfortable, breathable and sticks to wet skin to maintain a strong barrier and hold. Protect wounds and blisters with waterproof medical tape and bandages.